An Interview With Paper Nation. The soft baby blue, the thick journals with luxurious covers, the stationary and vintage furniture beckoned me to go into the store. I walk in and immediately feel like I’ve walked into a place that Style Me Pretty would approve of. He turns at the sound of the door opening, and greets me with a friendly smile. Today, I am interviewing Brian from Paper Nation. He finishes serving the customer and their familiar chatter comes to a close. After hello’s are said, he refills his coffee cup, we sit down, and the interview begins. PP – Last week, when we set up the interview, you asked what it would be about, and I said it would mostly be about how did everything come together, so today’s first question would be, How did Paper Nation come about? Brian – Well, I come from a retail background; I had left it for a little while, but I knew that I wanted to eventually open up my own shop. How the idea for Paper Nation came about, was when I was getting married. I couldn’t find any, 5×5 envelopes, and so, the idea kind of evolved from that. PP – Was there any schooling that you felt helped get the business started? PP – Did anyone influence you? In your decision to start your own business? Brian – Well, I do come from a family of entrepreneurs. My dad and my older sister and older brother are also all small business people, and always have been. So I guess it was only a matter of time before I got into it too. But yeah, they’re pretty much my mentors and heroes. They provided a lot of support and assistance. I find that small business owners speak a language that others who aren’t entrepreneurs don’t speak, so there’s camaraderie there with all the business owners in this area which helps a lot. PP – Does your family live in Abbotsford, then? Are you from Abbotsford? Brian – Not originally, no. I’m from Winnipeg. My immediate family are all back there. I moved to Vancouver and lived there from ’96 to about two years ago. So, I’ve been in BC for a long time, but new to Abbotsford. My in-laws live in Abbotsford, though, so I was familiar with it for a while. PP – So it hasn’t been too long since you’ve moved to Abbotsford, when did Paper Nation open? Brian – Paper Nation opened on 10/10/10. So it’s been about a year and..seven months? Brian – And counting, yes! PP – What’s a normal day around here, like? Brian – Oh my goodness. Well, the list seems to get longer and never shorter. There’s always a million things to do, because not only am I a small business owner, I’m also pretty much the sole employer here. So I’m not only working in my business, but I’m also working on my business. I’m helping customers, but I’m also working on my business, ordering products, marketing, financials, inventory. So the store is not only my retail store, but also my office. But the customers always come first, and it’s important to me to have a sense of community and belonging. PP – Speaking of the store, I really really loved the design and colors! Did you do all this or did you have someone come in and help? Brian – Why thank you! I chose the color. The branding, I worked with a graphic designer. Branding to me is very important because I would like to eventually see this business grow. Either a Canada wide chain of really unique boutique paper crafting stores, or paper stores. So it’s important to me that if you want to be that, you need to act like that kind of company right now. PP – Why the name “Paper Nation”. Brian – Well, we had a Facebook contest to name our store. A friend and I were going through the name entries when she said, “Paper Nation” and I thought, “That’s the one.” We still went through all the other entries but in the back of my mind I knew that was it. I loved it because the word “nation” is all inclusive and would work great with all the papers that I would bring in from different countries. PP – What would you say is the best part of your job? Brian – Definitely the customers. The people, the stories that they feel comfortable to share with me. They come in and say, you know, “Oh I’m doing a card for my son’s birthday” and then we get to hear about that. So the community and the people. Brian – Everything else? [laughs] No .. One of my teachers, had written a book using the metaphor of giving birth to a baby to starting a business. It really takes up 24/7 of your time and thought and emotion. So life is unbalanced, the first two years, three years, four years, I don’t know how long. It is a pouring in of heart and soul. I basically go to bed thinking about it and wake up thinking about it. It’s a labor of love. PP – So what’s an advice or tip that you wish someone had told you when you were starting out. I mean, no matter how many people you know, and how much they tell you, there’s always something that you have to learn on your own. 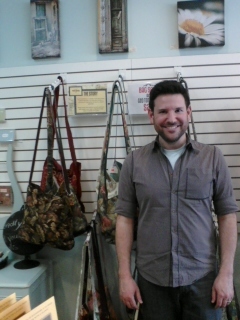 Brian and his dad’s purses in the background. Brian – Yeah! You know what, I think that as much preparation as someone could have, there are always going to be blind sides. You’re always going to be blindsided no matter how much preparation you do. And that’s just the nature of taking on a monumental project like this. So I’d say prepare, and educate yourself. Also to make sure you don’t start off undercapitalized, with too little money or products, because afterwards catching up is virtually impossible. That’s what happened to us, and now we’re constantly trying to play catchup. PP – Do you have a favorite product in the store? Brian – Well I really love all the local handmade stuff. But I also really really love pretty paper. But I’ll say my dad’s purses. He makes handmade purses, and although we’re a paper shop, we also sell gifts and things like these. PP – Are you planning any new releases or products? Brian – We have new products coming in every month or so. PP – Thank you very much for your time and answers! You can find, and follow, Paper Nation on Facebook, or subscribe to their newsletter on the site! Next Article An Interview with Agápe Bridal. This was a good interview, LT. I'm always fascinated by small business owners. I'm very creative, but somehow lack the entrepreneurial chops to figure out a way to turn the crafty things I love into money/business. I'm working on it, and I had no problem as an architect. But I'd like to try something else, and I just don't have that entrepreneurial gene. So, like I said, it's really interesting to me to read about how people get started, and why, and how. I'm glad you're doing this! Paper Nation is a great shop name, by the way! Yep, I thought the name was great too..
😀 Europe, check. Next stop, Canada! Great interview, Larissa! Inspiring for those considering a dream! Look at you! Barbara Walters would be proud (although, personally, I think you did a MUCH better job than she ever could). Love the name, Paper Nation. Very cool. I had never heard of SEEDS either. What an awesome program for entrepreneurs! How neat! I like Brian already and would love to visit Paper Nation. Dangit, I need to get to Canada.